State Senate leader Phil Berger announces plan to shore up state’s Read to Achieve initiative during a news conference Monday, April 1. Senate Bill 438, also known as the “Excellent Public Schools Act of 2019” was introduced by Senate leader Phil Berger, a Republican from Rockingham, who acknowledged Read to Achieve hasn’t lived up to expectations. As N.C. Policy Watch reported previously, the statewide report on Read to Achieve program found more than 43 percent of third-graders tested during the 2017-18 school year did not demonstrate reading proficiency. Berger noted that the new initiative would look to adopt best practices from other states. He cited Florida and Mississippi as two states were early childhood literacy efforts have experienced success. “The interesting thing about the Mississippi experience is, like North Carolina, they began a program similar to Read to Achieve without the individualized plans and then in 2016 they implemented the individualized plans and what they saw was a significant jump in their reading outcomes as a result of that,” Berger said. 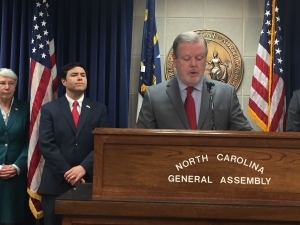 John B. Buxton, a member of the State Board of Education (SBE), said SB 438 address issues found when the board partnered with the N.C. Department of Public Instruction (NCDPI) to a look at Read to Achieve, data trends and what other states are doing to improve early childhood literacy. Buxton said the study found that North Carolina needs to “tighten implementation at the state and local level” for Read to Achieve and provide teachers with greater support. Superintendent Mark Johnson said early childhood literacy continues to be a top priority. After taking office, Johnson said he initiated a “deep dive” into how Read to Achieve was implemented by NCDPI. “What we found were hard truths about how NCDPI implemented that program and we took steps to make sure we addressed those issues,” Johnson said. He said he has been working with superintendents, schools of education, the General Assembly and teachers to identify other needed improvements for Read to Achieve. As it currently stands, Berger said SB 438 wouldn’t require additional money. “There’s been a substantial commitment of resources thus far to the Read to Achieve program and those dollars may well be sufficient to address the changes that we’re talking about but if it does take additional money, I’m sure the legislature will take a serious look at that,” Berger said.